Here are 6 characteristics of effective STEM Classroom Design that you can implement to encourage a positive STEM environment. A STEM classroom needs to be able to accommodate projects for science, technology, engineering, and math in addition to other subjects. Covering so many topics requires the classroom to be flexible. One minute the classroom may be set up for a formal lecture or presentation and the next it needs to accommodate hands-on group projects. Flexibility for the classroom starts with its desks and chairs. Having simple furniture that is lightweight and durable makes it easy to rearrange and withstand the messes of science experiments. Throw out your classic seating charts, students need the freedom to customize their team workspace in a STEM classroom. Some students may be sitting at desks, building something on the floor, or even standing around a single table. In order to make a STEM classroom flexible, the furniture needs to move easily. Wheels on the bottom of furniture allow for quick transitions. It also allows the classroom to have a different layout each day. The goal is for students to make the space their own and have the ability to move the furniture in creative ways. With mobile tables and chairs, students get to design the workspace that is best for them. Effective STEM classrooms also have mobile whiteboards. Its challenging for multiple teams to huddle around the two or three whiteboards on the walls in classrooms. Instead mobile whiteboards can be brought to their unique workspace. Whiteboards are an essential part of STEM classroom design because it allows for the quick visual display of ideas and are a necessary tool for the math component of STEM. STEM fields are technology driven. Therefore, it’s difficult to teach STEM, without having technology for the students in the classroom. 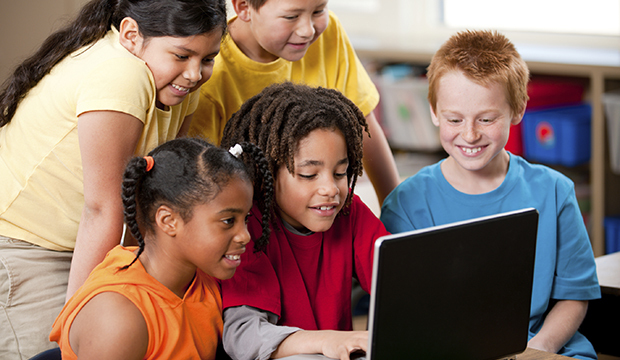 Tablets, laptops, and other technology help students collaborate in teams, research their ideas, and design solutions. More technology in the classroom means students need more power, powerstrips are an essential part of the classroom. At STEM Revolution we understand that funding technology for the classroom is a burden that many teachers face. Though technology in the classroom is important, we must consider that it is always changing. Just remember that it’s more important to have an adaptable classroom than to implement the most innovative technology. First, organize your supplies. Each team can receive a kit of supplies or there can simply be one central supply table. It all depends on the amount of prep-time available and how much time and effort you want to invest in the project. Second, organize your time. Make it clear to students how much time they have to work for the day, display activity directions clearly where all students can see, and have a clear signal, clapping or phrase, that let’s the students know when it is time to be quiet and listen. Third, organize your project storage. When it comes to STEM projects, especially engineering ones, students will often have partially completed projects that they will need to store until their next work time. Storage containers and designated shelving are both ideas on how to protect student’s work without cluttering up the classroom. For more ideas on project storage check out STEM Revolution’s STEM Classroom Board on Pinterest. STEM classrooms are learning spaces that inspire. Implementing these six characteristics result in an effective STEM Classroom design that creates a positive environment where students can learn, innovate, and collaborate.